Furniture design in the 60s encompassed a huge range of tastes. Scandinavian style represented middle class good taste at the beginning of the decade, and by the end of the 60s it was the choice of the majority of the population. Designers experimented with new materials, with cardboard and blow-up furniture enjoying a brief spell of popularity in swinging London. By the end of the decade, leading manufacturers were looking for the next trend to follow teak and experimented with a range of styles and materials from pine to Formica. The British furniture industry in 1960 was very different from that of ten years' previous. Modern furniture, rather than traditional, was popular and people bought furniture because they liked a particular brand, rather than because they trusted their local furniture shop. G-Plan was the established brand name of modern British furniture. The British furniture industry was facing tougher competition from overseas. Imports of furniture rose substantially in the late 50s, particularly from Sweden and Denmark. Danish furniture represented the epitome of middle class good taste in the early 60s and Scandinavian design had a strong influence on British furniture makers. Some of the most respected UK brands, such as Younger and Archie Shine, were making Scandinavian style furniture from the mid 50s, with other more popular brands soon catching up. A H McIntosh, F Austin and Stag launched their own versions of the Scandinavian style in the late 50s and early 60s. Surprisingly E Gomme, the maker of G-Plan, was slow to catch up. They took their brand up-market a level further when they employed Ib-Kofod Larsen to design the G-Plan Danish range in 1962. More and more British manufacturers introduced their own versions of the classic, low, long Scandinavian sideboard in teak, with matching teak chairs and dining table. Teak furniture now sold at all levels of the market; it was no longer viewed as a status symbol. The early pioneers and more exclusive makers now searched for alternatives. For the Scandinavian firms and for British furniture makers at the top end of the furniture market, who quickly adopted the style, teak was looking tired by 1963. Scandinavian firms switched to the more expensive rosewood. In the UK, the first firms to experiment with teak were the first to try alternatives. A H McIntosh introduced dining room furniture in American cherry, although they also made new designs in teak as well. Younger sold a new suite in African walnut. Gordon Russell avoided teak altogether and Ercol continued with its already popular range in English Elm. At the cheaper end of the market, manufacturers made furniture finished in melamine or 'Formica'. People found melamine surfaces easy to care for. It was a material clearly suited to the kitchen and makers exploited these qualities elsewhere in the house. There were melamine sideboards, melamine wardrobes and melamine dressing tables. Usually they gave the melamine a simulated wood finish. Imitation figured walnut suites in melamine were common. The most successful early move away from teak was the Minstrel range introduced by Stag in 1964. John and Sylvia Reid made a modern take on eighteenth century design and created one of the best selling furniture ranges of all time. Minstrel found a brand new market for modern furniture that was traditionally styled. It chimed perfectly with British middle class households and like Ercol, created a strong following with those who would be loyal to the brand for years to come. Terence Conran opened his first Habitat store in May 1964 on the Fulham Road in London. Habitat captured the mood of the times and was immediately popular with celebrities, as well as the younger generation. The new store offered a range of well-designed goods at reasonable prices. However, the essence of Habitat's success was that it sold a whole "lifestyle" package, as well as mere products. By the end of the 60s, there were nine Habitat stores throughout the country. Looking at early Habitat products today, some of them do not look that exciting. There is a strong emphasis on pine, which was still popular in the 80s and 90s. In the 60s though, it was new. As early as 1962, Conran launched a range of kitchen units in Swedish pine, called Summa. As well as the units, there was pine panelling for the walls. Habitat led the way to a Victorian rival in 1967. The Victorian look included the now ubiquitous Chesterfield sofa. Today we are so used to historical revivals that it is hard to appreciate how new and exciting this was at the time. The rediscovery of Victorian styles linked in well with the fashion for Victorian military uniforms and the graphics of the latter part of the 60s. Think of the cover of the Beatles' Sgt Pepper album, for example. Even earlier than this, Victorian style lettering was used in the opening titles of the popular film, "The Good, the Bad and the Ugly". Conran was among the first manufacturers to make pine furniture. Pine seems very average, even slightly boring, to today's eyes. In the 60s it was revolutionary. Pine was associated with cheap furniture made for the Victorian kitchen rather than the drawing room. Like working class denim in the fifties, it made the transformation from everyday material to the height of good taste. In 1965, designers William Sheppard and Michael Jacks refurbished a public house, 'The Merry Fiddlers' in Dagenham with modern pine furniture and fittings. It was an attempt to recreate the atmosphere of a traditional pub, yet make it attractive for the young workers at the nearby Ford Car Plant. It was clear that pine represented an attractive atmosphere for young people. Harry Palmer, played by Michael Caine, had a very modern pine kitchen with a breakfast bar in the 1965 film, 'The Ipcress File'. Harry Palmer, like Len Deighton who wrote the book, was a keen amateur gourmet. His kitchen represented the best taste of the time. Pine was only available at 'Habitat', specialist shops or the trendier furniture sections of department stores. At the other extreme to the country kitchen look was the increasing popularity of office-style furniture for the home. Some people needed a desk and office chair at home; others thought what was good enough for the boardroom was good enough for the lounge. Both Hille and Conran specialised in furniture for businesses. Some of their designs for office use also found their way into fashionable homes. Woollands' Managing Director, Martin Moss, saw the potential of Conran's contract furniture for the domestic market. Increasingly the high backed swivel chair from the top executive's office looked just as good in the modern home, and the swivel chair on a metal pedestal base became a status symbol in the sixties' home. Hille suggested that their 'Leo' office chair was equally usable at home. Gimson and Slater manufactured a chair simply called the 'Status' chair; with its deep-buttoned high back swivel pedestal base; it looked the part. The end of the 60s saw a trend towards disposable furniture. Blow-up and disposable cardboard chairs went on sale. Ideal Home Magazine interviewed three young married couples in the late 60s about their furniture choices. All were keen on paper lampshades and table cloths. One couple had a cardboard dining room suite. Under their purple cloverleaf shaped cardboard table fitted six paper chairs. They were hardly Mr and Mrs 'Average'. One owned a dress manufacturing business, and of the other two couples, both husbands were designers. In Britain, paper manufacturer New Merton Board Mills made the most successful range of cardboard furniture. They marketed the chairs and other furniture in a range called 'Those Things'. The chair was a 'chair thing'. Inflatable furniture was a natural development from the lilo and the paddling pool. The most well-known was the 'Blow' armchair manufactured by Italian firm Zanotta in 1967. Conran also marketed inflatable furniture in the late 'sixties. The throw away culture was very different from previous generations who would buy one set of furniture to last a lifetime. It was possible to reinvent the look for the whole of your house or flat every few years. However, for a large section of the population, the solid values of quality furniture were still appreciated. A survey by marketing consultants in 1970 showed that just under half of the population aspired to have G-Plan in their homes. The trend for inflatable and cardboard furniture was as ephemeral as the furniture itself. 'House and Garden' officially pronounced the three-piece suite dead in 1965. A survey to find out if you had an 'OK' home gave minus 10 points for the traditional suite. 'House and Garden's 'OK' chairs included Mies van der Rohe's Barcelona Chair, Arne Jacobsen's Egg Chair, and Charles Eames' armchair and footstool. All of these were available new in 1964 for �196 [�2724 in today's money], �67 [�931] and �164 [�2280] respectively. A Chesterfield was also 'OK,' as artist Bernard Buffet had two. The article recommended modern chairs from H K, Guy Rogers or Conran, provided, of course, that they were not bought as part of a three-piece suite. For most people though, the three-piece suite was still the obvious choice. 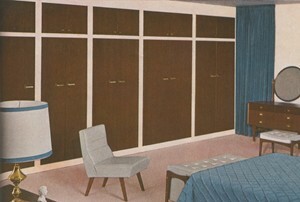 Room dividers and unit furniture were both around in the 50s, but the development of the 60s was fitted furniture or the fitted look. A trend in new house building of the sixties was built-in furniture. The builder's carpenter fitted the kitchen units and built-in wardrobes. In 1962, the building trade introduced a standard 4" module for room dimensions. This made it possible to make furniture in various widths, divisible by 4" that would fit any room. Some of the early pioneers of this new type of furniture were not from the home furniture industry. Alfred Cox made fitted furniture for hotels and Brooke Marine of Lowestoft made fitted cupboards for trawlers. Both firms experimented with fitted furniture for the home. However, their prices were prohibitive for most people. Basil Hyman saw that there was a market for built-in furniture at prices most people could afford and realised that fitted furniture had one cost big advantage. If the wardrobes had no backs, there was no purchase tax to pay. Hyman launched a new range of fitted bedroom furniture called Limelight 'Space-Fitta' in 1964. The original adverts told people that they could fit 'Space-Fitta' themselves, but the retailer usually fitted it. Initially retailers did not want to be bothered with fitting furniture and did it badly. Hyman then recruited his own retailers from outside the traditional furniture retail trade. They opened shops dedicated to selling only Limelight 'Space-Fitta'. Other firms quickly joined the race for built-in furniture. Meredew introduced the 'Mereform' interchangeable unit range in light oak. A year later F Austin introduced the 'Multiglide' range designed by Frank Guille. Stag introduced the 'Opus 22' range in 1965. German designer, Walter Muller, designed 'Opus 22'and Stag made it under licence in the UK. It had the fitted look, but was actually free standing. Opus 22 had a range of internal fittings that people rearranged to suit changing needs. There were drawers, shoe racks, shelves, hanging rails and mirrors. Stag's advertisements showed wardrobes neatly storing clothes, shoes, suitcases, golf clubs, typewriters, teddy bears and diving equipment. As the 'sixties ended, Uniflex launched a remarkable range of bedroom furniture and dining furniture called Apollo 70. It was finished in white melamine. The circular dining table had a rosewood top. The chairs might have come out of a Beatles' Yellow Submarine cartoon. They had exaggeratedly wide frames and legs. 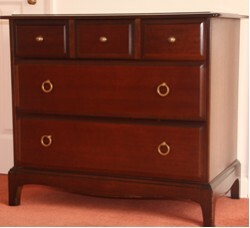 The sideboard had large rosewood handles in the shape of two rectangles with rounded corners. On the handles were aluminium circles. It was indeed furniture for the space age, or at least for the 70s. There were some remarkable new developments both in design and in the way people bought furniture. We now had flat pack furniture, melamine furniture, moulded plastic furniture, even cardboard and inflatable furniture. Some of these developments disappeared with the 60s. Others became part of the experience of buying furniture in the new decade and for years to come.